This post continues on from Getting started with Web API and OData V4. 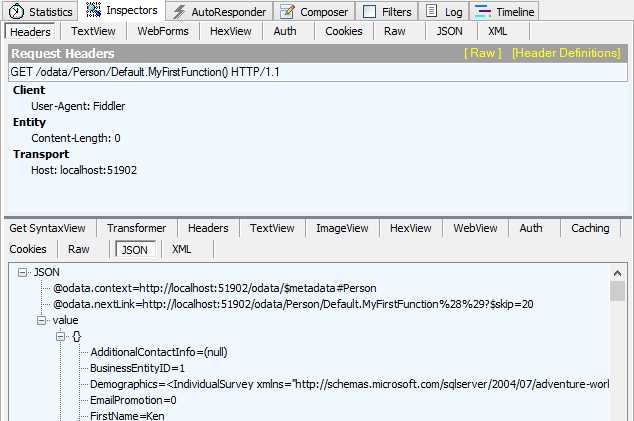 Web API 2.2 OData V4 no longer supports DateTime! DateTimeOffset is supported instead of this. $inlinecount has also been replaced with $count. With Web API OData V4, it is possible to create complex queries which can use functions etc to page, fill data tables or filter your data as required. In this post, some of the basic or standard queries are demonstrated. This replaces $inlinecount from V3. Count also needs to be enabled. This returns the total count of possible records. The odata.count for this example is shown below. The PersonController uses OData attribute routing. This is similar to Web API attribute routing. You can add an ODataRoutePrefix attribute to the controller or ODataRoute attributes to the different actions. 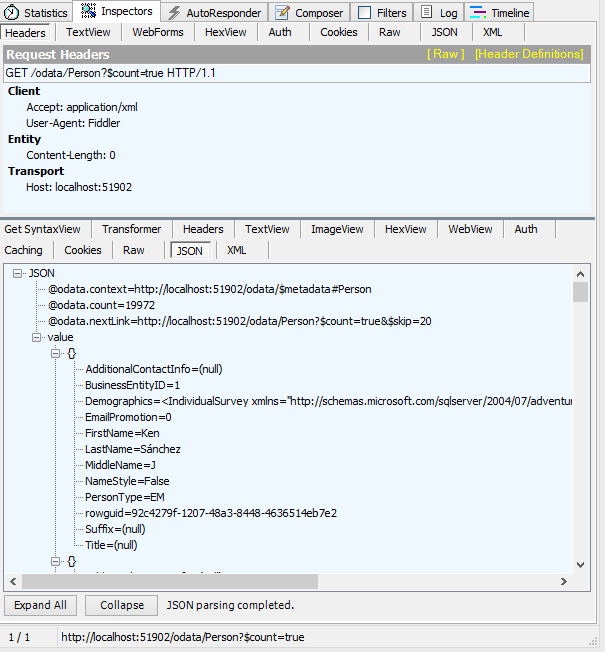 As with Web API attribute routing, various parameters can be added to the URL. OData Attribute Routing can be activated in the Web API config method. OData V4 Functions allows for specific or complex selects to be called with a simple function call. The Web API config needs to be updated from the last post. It is possible to define a function for the whole service, for a collection of specific entities or for an entity itself. In this example, the function is defined for a collection of Person entities. The functions or actions require a namespace in the Web API implementation of OData V4. If none is defined for the OData model builder in the configuration, a “Default” namespace is used. This is different to the old WCF Data services which supported V3. Dinesh, first–great blog and article! My concern is that each blog I see on ODATA v4 seems to skirt the big breaking changes issues–namely, the DATETIME vs. DATETIMEOFFSET changes. Many are not in a position to modify the database schema or sometimes even the supporting code. So when attempting to upgrade from V1-3 to V4, we run into this roadblock… what are some practical, thread-safe solutions out there that address this concern? I agree with you. I have provided a possible solution for mapping DateTimeOffset to DateTime database fields in Entity Framework so you don’t need to change your schema. This is a breaking change which makes updates difficult. Operations on ContactType.ModifiedDate not supported. The path template ‘Default.MyFirstFunction’ on the action ‘MyFirstFunction’ in controller ‘Person’ is not a valid OData path template. Resource not found for the segment ‘Default.MyFirstFunction’. I keep getting error! Any hints. The Default is the standard namespace if none is defined. You had probably figured out the solution by now, but maybe this could help others that will be facing this issue. What is a good strategy for applying authorization to $filter? For example, Customers with Orders: customers can only view their own orders, but Adminstrators can view any customer’s orders. Is there a way to apply authorization to something like “$filter=Customer.CustomerNumber eq 12345”? I know this is old, but I found this so others will too. In .Net services I generally handle this in the server side logic. For each query made within the endpoints of a controller, I pass the IQueryable statement to a method that applies the relevant security logic for that entity. So we have a case statement that evaluates the group permission of the currently logged in user (just use standard HTTP security mechanisms) and for certain groups adds filters to the query, before we apply user’s odata query to the IQueryable. The first basic filter is for multi-tenant environments to force that the data is scoped to the current tenant, but unless the tenant identifier is passed in as a headeryou will either need to evaluate it from SAML tokens from the authentication provider or from some custom data store for your solution. Note that for each entity the path back to the tenant descriminator field in a normalised DB could be different, so it is invariably something you have to manage in code manually, but the pattern itself is easy to template out and describe either through inheritance or interfaces.